Although the article "Trump's Ideas About the Deficit Sound Inflationary" (by Finance Professor Noah Smith) was supposed to tell readers how crazy Donald Trump's theories about debt were, it actually highlighted that mainstream views about inflation are actually the ones that are fairly ludicrous. 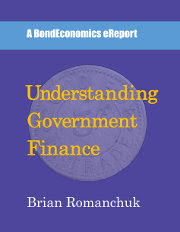 I would note that I cover most of the underlying debate behind this article in Understanding Government Finance. And true to form, the next week Trump reversed himself. Instead, he suggested that the Federal Reserve could just print money to pay off the debt, instead of defaulting. “You never have to default because you print the money,” he declared. The question is whether this is a good idea. Many economists believe that if you print a lot of money, inflation will go way up. That’s interesting, because Trump is right. Lots of countries are in a position to just print money to pay off debt. [...] If your debt is in dollars, then it’s even easier -- just fire up the presses and pay it off. Under any reasonable analysis, the only way government spending can generate inflation is via "excessive" deficits. However, changing the mix of liabilities between money and debt is not going to have any effect, beyond whatever implications there are for the level of interest rates. A common sense interpretation of Trump's remarks is that he is using "paying off the debt" in the way people normally use the term: money is expended to extinguish debt liabilities. The implication is that this is purely an exchange of financial assets -- issuing money to extinguish Treasury liabilities. Such a step is a purely a balance sheet shuffle, and has no implication for the level of deficits. And it is not as if we have not seen such balance sheet changes in the past; countries have routinely changed the maturity structure of their debt outstanding, without any observable effect on macroeconomic performance. Interpreting Trump's remarks in a way that assumes that excessive deficits are implied by the observation that the government need not default is purely a projection of Noah Smith. The article goes off the rails when it gets to hyperinflation. So there’s a fear that if the U.S. starts paying off the debt using printed money, the result could be an inflationary spiral -- everyone raises prices because they expect everyone else to raise prices. That in turn could explode into hyperinflation, a rare but terrible phenomenon in which a currency essentially becomes worthless, wrecking the economy in the process. Venezuela is experiencing this now, and it isn’t pretty. Hyperinflation would be even worse than default. This is another example of the principle that an argument that revolves around hyperinflation is probably a waste of time. His view of why Fed purchases of bonds had no effect on inflation misses the mark -- it is because it is a reshuffling of government liabilities. Meanwhile. this is not just wacky "MMT Theory"; this is also what the governmental budget constraints in mainstream DSGE models say. If you look at the Fiscal Theory of the Price Level, primary surpluses determine the price level, not the mix between "money" and "debt." However, he seems to blissfully unaware of the fact that academics have actually studied economies in hyperinflation, and a hyperinflation is not just an extension of "high inflation." People do not just wake up one morning and decide to raise the price level by 10% based on the expectations of some "representative" household. The domestic currency needs to be essentially abandoned, and transactions indexed to some external store of value (a hard currency). Hyperinflations are typically associated with government deficits that are around 50% of GDP, which is a deficit of a size that is not advocated by anyone serious (and I presume, Donald Trump). It would take a great deal of institutional changes to allow a hyperinflation to take root in a modern economy. Private sector institutions need to change, with transactions indexed to some external store of value. Meanwhile, fiscal stabilisers would rapidly squelch a surge in the price level under current behavioural norms. Government taxes are withheld at source, and are therefore effectively indexed in real time, while almost all spending is not indexed in real time. A jump in the price level would cause a rapid movement towards a fiscal surplus, which would kill the excess demand that was allegedly fuelling the hyperinflation. I have no idea whether Donald Trump's platform makes any economic sense, but the mainstream media does not help itself by publishing sensationalist silliness like this. £5.4t of 'printing money' so far via QE at the Federal Reserve. What devastating effect has he seen so far? Japan has been in the same boat for decades. Nothing much has happened. What he misses is basically all government spending is 'printing money' because they run massive intraday overdrafts like the banks and clear at the end of the day. The government already created the money, then people bought bonds. Why is Noah not for constraining bank lending if he thinks money creation causes hyperinflation? "17. Government bank accounts at the Bank of England are linked together in a system known as the Exchequer Pyramid, to ensure that any cash balances that remain at the end of each day are channelled into the main central government accounts to reduce the government's cash borrowing needs to a minimum. If the Consolidated Fund has a surplus at the end of the daily operation this is automatically transferred to the NLF to reduce its borrowing needs. If, on the other hand, the Consolidated Fund is in deficit, for example through outflows on the day being greater than taxation receipts, this is automatically financed by a transfer from the NLF. The NLF will then borrow overnight any remaining cash deposits held in any government accounts at the Bank of England (including the accounts held by government departments at the OPG). The overall effect of this will be a net Exchequer Pyramid surplus or deficit in the NLF. 18. The net surplus or deficit in the NLF is automatically balanced to zero each day by a transfer to or from the Debt Management Account operated by the Debt Management Office (DMO). The DMO's cash management objective is each day to balance this remaining position on the NLF. It does this by issuing Treasury Bills and by borrowing or lending in the sterling money market during the day. To achieve this objective the DMO needs reliable forecasts of each day's significant cash flows into and out of central government, and up to date monitoring information on actual cash flows as they occur. For cash management purposes the flows that matter are those which cross the boundary between the Exchequer Pyramid accounts at the Bank of England and accounts elsewhere (ie cross the outer black line of the chart annexed to this memorandum). 19. When government is a net lender on a particular day because, for instance, tax receipts exceed spending, the DMO lends the cash back out into the market. The effect is to balance up cash holdings across the banking sector because, if government has received more cash on the day than it has spent, the commercial banking sector will have an equal and opposite deficit. 20. The DMO has put arrangements in place with the Bank of England and the main settlement banks to ensure that its position is balanced at the end of each day, even when there have been very late changes in the forecast of government cash flows on the day. The DMO also maintains a small (£200 million) balance at the Bank which acts as a buffer, eg in the event of a change in the net government position following the final reconciliation of the government accounts in the Exchequer Pyramid after the end of each day." "Meanwhile, fiscal stabilisers would rapidly squelch a surge in the price level under current behavioural norms." Plus what if the U.S. implemented better policy. More so if (pro cyclical) bank lending is limited, Job Guarantee implemented, plus there is plenty of efficiency improvements in US via universal healthcare (look at how much they spend on healthcare in % GDP! ), BS non jobs like marketing, banning things etc. And of course tax rises to stop inflation. That's such a good point about the tax collection going way up. I'd never thought of that before. But you're right; that would put a brake on the process. My thoughts on hyperinflation from some time ago.